Majorca relies on its agriculture and tourism to support its economy. And the locals devote much of their time to both trades, even combining the two for inquisitive visitors that want to explore the islands unique flavours. The cuisine on the island is predominantly influenced by the mainland, although Majorcans are proud of their culinary heritage and are always keen for visitors to indulge in their recipes. Olive trees were introduced to Spain by the Romans, and olive groves have been such a mainstay of Majorca’s economy, olive mills and infusion dishes have become museum pieces. 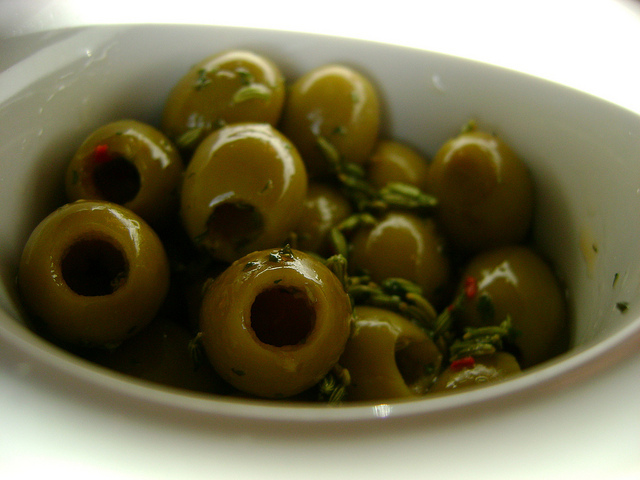 The olives in Majorca are smaller than those found on the mainland and are typically eaten before or with meals. Olive oil is also a regular ingredient in Majorcan cuisine, sometimes used to simply flavour the bread. Visitors looking to invest in some extra virgin oil whilst in Majorca, should check out the olive tours, or better still, head to the quaint village of Caimari for the annual Olive Fair in November. Whilst visiting Mallorca, look out for the ramallet tomatoes. They are easy to spot because they are traditionally tied together with string and hanged to a shelf or beer keg. If you try the pa amb oli, it will probably be made with ramallet tomatoes. Tomatoes are a key ingredient in Spanish cuisine, although when Spanish Conquistadors first came across the fruit in Mexico, they thought it was poisonous due to its bright red colour. Not many holidaymakers pass up the opportunity to sample the local liqueurs in Majorca. Ask for Hierbas, a native concoction made with special herbs, and you will be asked whether you want dry, sweet or mixed. Almonds and oranges are also a popular ingredient in Majorca, so it should come as no surprise they both feature in liqueurs. Angel d’Or Orange is famously made in the romantically named, “Valley of Gold,” and the tradition of making almond liqueur dates back to the Middle-Ages. Palo is another traditionally liqueur and is sometimes drank as an aperitif so you may be invited to enjoy a tipple in restaurants. Its distinctive flavour is bitter-sweet, made from caramel and chinchona bark. The soft centre of the sausage makes it possible to be spread on bread, although it’s often added to sauces to add depth and flavour as well. You can get two versions; coent, the spicy one and dolc, the non-spicy one. An annual fair held celebrating the sausage is held in Campo. The tasty sausage is also added to a favourite dish of the locals, huevos a la sollerica, fried eggs served over a sobrassada and served with a delicious pea sauce. There are great guides to Majorcan food, such as this one by Holiday Hypermarket, and this one by Puerto Pollensa. Knowledge up before you gobble up – you might be in for a surprise at what’s inside.